The architecture reflects the needs and lifestyles of its inhabitants and their response to the natural environment. It differs according to the natural materials available locally and the history and personality of each region. Before looking more closely at the traditional architecture of each of the three regions - the limestone Causses, the slatestone Cévennes and the granitic Mont Lozère - we should mention certain features in common to all the tree of them. The homogeneity of the traditional architecture is a product of the physical restrictions imposed by nature, including a relatively high average altitude and a harsh climate. Travel is difficult and urban centers are far away. Soil quality is usually poor except in some valley bottoms which have been covered with with more fertile sediments. In this hostile milieu people have learned to construct buildings for themselves, for their livestock and to store their crops, out of local materials alone. They build their houses on land of no agricultural value, in most cases on rock in order to have a solid foundation and facing the sun; in the Cévennes, however, this is not always so. The main living-room of the home, which also serves as the kitchen, is protected from extremes of temperature by a windowless wall or is cut into the rock. 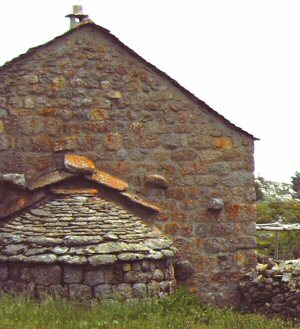 The chimney is always set against a gable wall, with the opposite gable separating itself from the stable or workshop. The entrance and one or two small windows are placed in the sunny facade. The area above the kitchen is used for sleeping or for storing hay or other things. The roof is supported by powerful beams or a stone vault strong enough to withstand heavy snow and at the same time insulate the house. In all three regions the rearing of livestock was the main source of income in an economy based on self-sufficiency, seasonal work in a neighbouring region and the exchange of goods. The animals were housed immediately below or adjacent to the living quarters, with their forage stored close at hand. An increasing population and changes in farming practices made it necessary to expand: new buildings were added ine every possible direction, sometimes eventually forming an inner courtyard, which had the advantage of providing extra protection.Traditionally the buildings are of local stone, quarried if possible on the spot, and these materials determine the style of the construction and the techniques used.In areas without timber the floors and roof are supported by vaults. 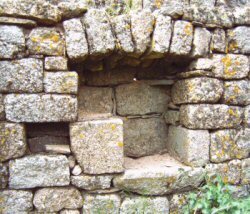 The walls are thick and are composed of two outer surfaces held together by big stones called 'boutisses' which traverse the wall, the space between being filled with rubble, sand or clay or, more recently, with mortar. The lintels of the doors and windows are of stone. The age of a building is hard to determine because the stones and even the timber (when timber is used) were employed again and again with techniques and building styles that have hardly changed for centuries. Nor are the personal touches of each builder easy to interpret. The layout of the buildings is the result of a long history of adaptation that lasted until the beginning of the twentieth century, when farming started to decline and many families left the land. Fortunately, this heritage is now being restored with a new respect for these monuments of a distinct social and technical culture.